Go to original pattern for design DROPS 138-18. 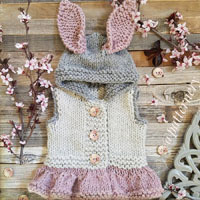 Knitted DROPS jacket in ”Bomull-Lin”, ”Alpaca Bouclé” and ”Cotton Viscose”, worked sideways with crochet squares along the bands and round the sleeves. Size: S - XXXL. Bust: 100-116-132-148 cm / 39½"-45 3/4"-52"-58"
Full length: 60-60-69-69 cm / 23½"-23½"-27"-27"
DROPS CIRCULAR NEEDLE (80 cm / 32'') SIZE 5 mm /US 8- or size needed to get 17 sts x 22 rows in stockinette st = 10 x 10 cm / 4'' x 4'' with stockinette st and stripe pattern. 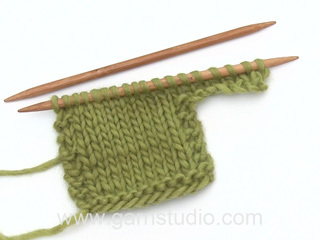 DROPS CROCHET HOOK size 5 mm / H/8 – or size needed to get 1 crochet square = 9 x 9 cm / 3½'' x 3½''. * 6 rows Alpaca Bouclé, 2 rows Cotton Viscose, 6 rows Bomull-Lin, 2 rows Alpaca Bouclé, 4 rows Cotton Viscose, 2 rows Bomull-Lin, 2 rows Alpaca Bouclé, 4 rows Bomull-Lin *, repeat from *-*. Worked in 2 parts from mid front / mid back and out to the sides. Worked back and forth on circular needle to make room for all the sts. Beg mid back at the bottom of back piece, then cast on more and more sts up towards the neck and then cast on sts for front piece. Loosely cast on 19-19-22-22 sts on circular needle size 5 mm / US 8 with Bomull-Lin. K 1 row (from RS) – AT THE SAME TIME at the end of row, loosely cast on 13-13-15-15 new sts = 32-32-37-37 sts. P 1 row but 1 st at the bottom is worked K on all rows. Continue in stockinette st while at the same time casting on 13-13-15-15 new sts at the end of every row from RS until there are 97-97-112-112 sts on needle. P back. Switch to Alpaca Bouclé and continue in stockinette st and STRIPES – see explanation above – at the same time work first and last st in each side K on all rows. When piece measures approx. 9 cm / 3½'' at the top (i.e. on the most narrow part = towards the neck) - adjust so that next row is worked with Bomull-Lin - loosely cast on 107-107-122-122 new sts at the end of next row from RS (for front piece) = 204-204-234-234 sts in total. K the 107-107-122-122 new sts from WS, work the other sts P except 1 edge st which is worked K. NOW MEASURE PIECE FROM HERE! Continue in stockinette st, with stripes and 1 edge st in each side K on all rows. When piece measures approx. 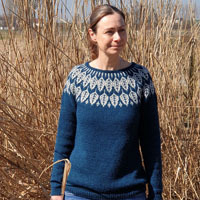 16-20-24-28 cm / 6 1/4"-8"-9½"-11" – adjust so that the next 2 rows are worked with Bomull-Lin or Alpaca Bouclé – LOOSELY bind off 70-63-78-78 sts at the beg of the next 2 rows (it is very important to avoid a tight bind off edge) = 64-78-78-78 sts remain on needle. Work stripes with 1 st in each side in garter st for approx. 16-15-14-13 cm / 6 1/4"-6"-5½"-5 1/8" for sleeve (shorter measurements in the larger sizes because of broader body width), K 1 row from WS before LOOSELY casting/binding off from RS (bind off with same yarn type as last stripe). 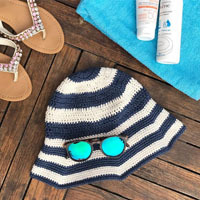 Work as right front piece but reversed. NOTE: 1 row in stockinette st must be worked before starting casting on new sts, i.e. cast on at the end of every row from WS. When the 107-107-122-122 new sts for front piece have been cast on, P the first row over these sts from RS. NOTE: Make sure to cast on and bind off sts on the same stripe as on right front piece so that front pieces match. 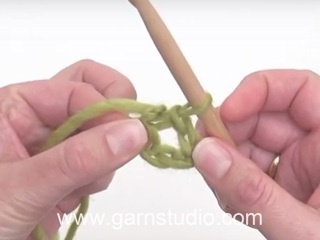 Ch 4 on hook size 5 mm / H/8 with 2 strands Cotton Viscose and form a ring with 1 sl st in first ch. ROUND 1: ch 3 (= 1 dc), then 7 dc in ch-ring, finish with 1 sl st in 3rd ch from beg of round (= 8 dc), cut the yarn. ROUND 2 (switch to 1 strand Alpaca Bouclé): Work 1 sl st in first dc, * ch 3, in same dc as sl st work 3 tr but wait with last pull through on each tr until all have been worked, make 1 YO and pull yarn through all 4 loops on hook, ch 4, 1 sl st in same dc as all tr were worked, 1 sl st in next dc *, repeat from *-* in all dc from previous round but the last time work 1 sl st in first sl st from beg of round (= 8 leaves), cut the yarn. ROUND 3 (switch to 1 strand Bomull-Lin): Work 1 sc at the top of first leaf, * ch 4, 1 sc at the top of next leaf *, repeat from *-* around the entire flower and finish with 1 sl st in first sc (= 8 ch-spaces). ROUND 4: * In first ch-space work: 2 sc, 1 hdc, 1 dc and 1 tr, then work 1 tr in sc (= the corner), in next ch-space work: 1 tr, 1 dc, 1 hdc and 2 sc *, repeat from *-* the entire round, finish with 1 sl st in first sc from beg of round, cut the yarn. Work 24-26-28-28 squares. Sew 16-16-18-18 squares tog into a long strip, sew edge to edge with Bomull-Lin and 1 stitch in every st. SIZE S/M: Sew 4 and 4 squares tog into 2 circles. 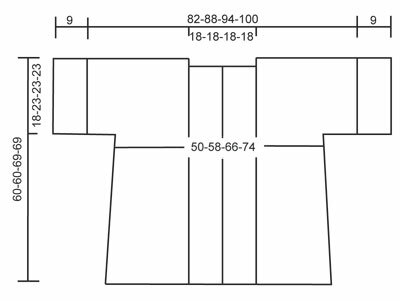 SIZE L, XL/XXL and XXXL: Sew 5 and 5 squares tog into 2 circles. Sew left side and right side tog mid back, sew with stitches on the inside of cast on edges. 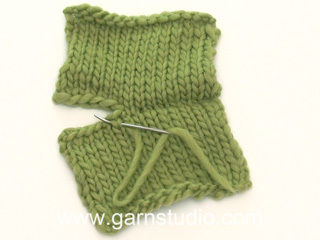 Then sew side and under arm seams on the inside of bind off edge and 1 edge st respectively. 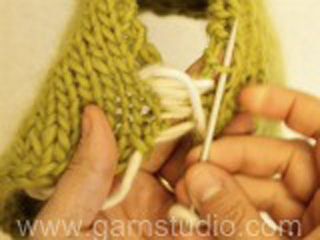 Fasten the circle of 4-5-5-5 squares at the bottom of each sleeve – sew edge to edge in the same yarn type as bind off edge, to avoid a chunky seam. Fasten the 16-16-18-18 squares along the bands and back of neck. Start by fastening the 2 middle squares mid back of neck and distribute sts on front pieces evenly down the squares. Work with Bomull-Lin as follows: 1 sl st in first st, * ch 3, skip 1 st, 1 sl st in next st *, repeat from *-* and finish with 1 sl st in first sl st, fasten off. I made this jacket and added a border of flowers on the bottom too. Looks stunning and has received many complements. It is one of the best things I have made so far!! Thanks for the pattern!!! It looks good in the thumbnail. Unfortunately, can't vote on it if I can't see it in expanded view...won't open. Denne var utrolig fin. Gleder meg til mønstret kommer. Heel leuk maar te breed, ik zou gaan voor een getailleerd model. Ich finde die blumenleiste sehr schön von der jacke.